Director – Ron Howard, Screenplay – Akiva Goldsman & David Koepp, Based on the Novel by Dan Brown, Producers – John Calley, Brian Grazer & Ron Howard, Photography – Salvatore Totino, Music – Hans Zimmer, Violin Solos – Joshua Bell, Visual Effects Supervisor – Angus Bickerton, Visual Effects – CIS Vancouver (Supervisor – Mark Breakspear), Double Negative (Supervisor – Ryan Cook), Mattes and Miniatures, The Model Unit, The Moving Picture Company (Supervisor – Richard Stammers) & The Senate VFX (Supervisor – Richard Higham), Special Effects Supervisor – Clay Pinney, Makeup Effects – David Anderson, Tony Gardner & Kazuhiro Tsuji, Production Design – Allan Cameron. Production Company – Imagine Entertainment/Skylark Productions/Columbia. 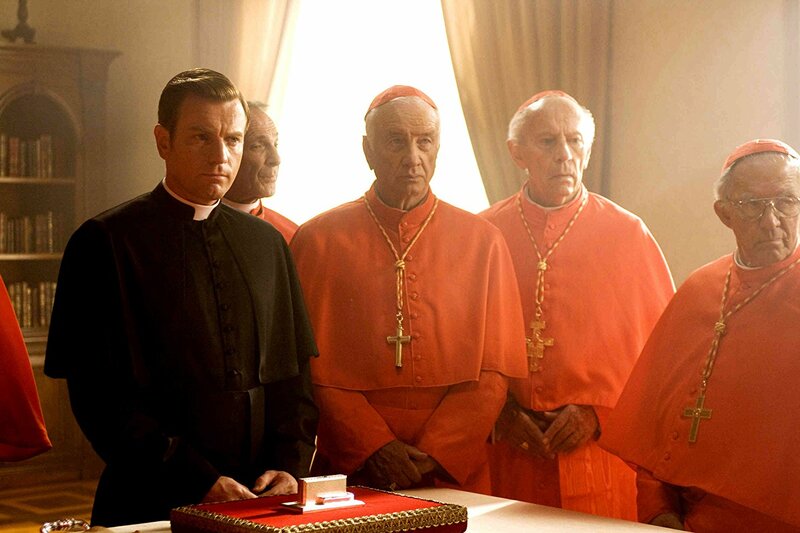 Following the death of the Pope, The Vatican goes into Conclave to elect a successor. Meanwhile, at the CERN laboratory in Switzerland, physicist Vittoria Vetra conducts an experiment that creates a small amount of antimatter. The magnetic flask containing the antimatter is then stolen. Robert Langdon, Harvard Professor of Symbology, is urgently summoned to The Vatican to advise after an ambigram that is the calling card of the secretive ancient anti-Papal organisation The Illuminati is found. The Illuminati have abducted the four Preferiti – the cardinals who are the most likely candidates to be elected pope – and have left a message that they are intending to kill them at regular intervals and at an appointed hour detonate the antimatter flask, which will cause an explosion that would obliterate the entire Vatican City. Langdon believes that he can find the missing cardinals by tracing the Path of Illumination – a series of symbols and clues to guide prospects to various locations through the city that point to the ancient hideout of the Illuminati. 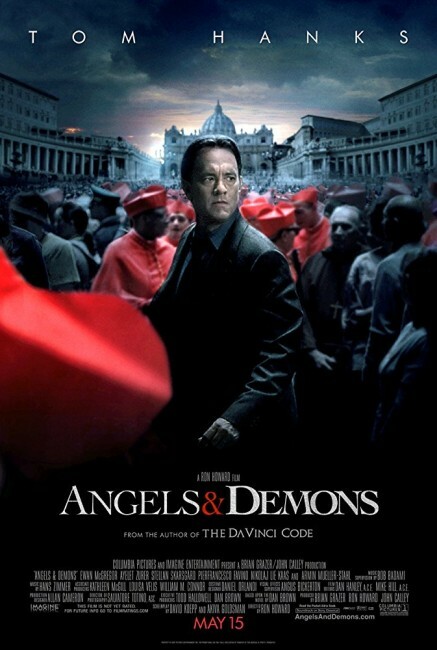 Angels & Demons is a sequel to The Da Vinci Code (2006). The Da Vinci Code was adapted from Dan Brown’s massively popular 2003 novel, which was based on non-fictional conspiracy theories about a bloodline founded by Jesus Christ, the existence of which has purportedly been kept a secret throughout the ages by various artists and leading thinkers of the day. Brown’s ideas were historically absurd (in fact, some of what he claimed to be researched truth was based on known fraudulent documents) but this did not stop The Da Vinci Code becoming a No 1 best-seller around the world, inspiring numerous copies and spinoffs, even tours of the sites and artworks mentioned in the book. This culminated in the film adaptation directed by Ron Howard with Tom Hanks in the role of Brown’s symbologist hero Robert Langdon. The film was massively successful, although was fairly much agreed upon as being a disappointment by fans of the book and general moviegoers alike. For a sequel, Ron Howard and screenwriter Akiva Goldsman turned to Angels & Demons (2000), the first published of Brown’s Robert Langdon novels. Angels & Demons is filled with the things that Dan Brown loves – cryptology and puzzles; a fascination with historical conspiracy (real or imagined); a love of classic art and architecture; a dislike of the Catholic Church and a persistent belief in its malign influence on history. I must confess to not liking Dan Brown’s books at all. The cryptic detective game throughout history and classic art is the whole of the story and while this can be entertainingly preposterous in its own right, matters like basic plausibility, depth of characters and a worthwhile prose style tend to be sacrificed for these considerations. The good news is that screenwriters Akiva Goldsman and David Koepp (see below for either’s other screen credits) have treated the book liberally. In an interview, Ron Howard said that there was less pressure to adhere to the source novel faithfully because Angels & Demons was not as well known as The Da Vinci Code. As a result, a number of characters have been changed around and given different names/backgrounds. Several subplots have been omitted – the kidnap of Vittoria; the elimination of the character of Vittoria’s father; a different set of events at the beginning, which originally had Langdon being called to the CERN laboratory and beginning his investigation from there. Mostly a good deal of Dan Brown’s nutty plotting surrounding the camerlengo have bitten the dust – his claiming to receive visions that lead everybody to the whereabouts of the antimatter canister; Langdon going up in the exploding helicopter too and surviving despite jumping out without a parachute; and especially the whacky revelation that the pope was killed because he had conceived a son through artificial insemination, with the son later revealed to be the carmelengo himself. The changes aside, Akiva Goldman and David Koepp keep fairly closely to the heart of Dan Brown’s plot. Alas, even with the artificial insemination plots removed, Angels & Demons is still a preposterous film. [PLOT SPOILERS] We learn that in order to cover up a murder, one papal assistant (along with a hired hitman) has to wit:- stolen a flask of antimatter from a highly guarded laboratory; abducted four cardinals and is planning to detonate the flask in the Vatican City; has resurrected belief in the ancient cult of the Illuminati and set up a path of cryptic clues in order to murder the four prefereti around the city to give the impression that it is the Illuminati at work; has done this despite the fact that only person able to be perceive the trail of The Illuminati is Langdon (and even then only with much research of obscure documents) – and this despite the fact that in the last film Langdon was regarded as a heretic that had uncovered such dangerous information that the Catholic Church had to eliminate him, something that is now swept under the carpet as ‘an incident’; that the existence of The Illuminati has been fabricated so that (in the film’s most preposterous scene) Ewan McGregor’s camerlengo can stage a sequence of events where he snatches the antimatter flask, takes it up in a helicopter, lets it detonate while he parachutes to safety in full view of the crowds in St Peter’s Square in the knowledge that the crowd would proclaim him the popular favourite by the papal Conclave (in a way that would also require the notoriously tradition-bound cardinals of the Conclave to break its own rules). It is a plot that has more to do with Dan Brown’s love of creating complicated historical puzzles than any scheme that could credibly exist in the real world. By about the point of miraculous visions of antimatter explosions above St Peter’s Square (something that should by rights have the crowds below showered with fatal doses of hard gamma radiation) and Ewan MacGregor as the parachuting priest, all credibility has evaporated from the film. Angels & Demons works far less effectively as a film than The Da Vinci Code did. If nothing else, The Da Vinci Code held you to it not by Ron Howard’s generation of suspense but by the absurd improbability of Dan Brown’s historical conspiracy, which at least had a conceptual ingenuity that you were prepared to give some rope to for the sake of its sheer entertainment value. Alas, the mystery created in Angels & Demons is far less interesting. There is a series of cryptic puzzles that lead to various locations around Rome and much talk of the conspiracy junkie favourite of The Illuminati but this mostly seems to consist of Tom Hanks running around like a stereotypical wild-eyed madman muttering cryptic phrases in Latin and finding enormous significance in patterns of numbers. As in The Da Vinci Code film, we are never privy to the process of Langdon’s deductions. The result is a mystery that races from one beautiful classic setting to another, involves a few murders but seems to lack any of the suspense and moments of aha ingenuity that a good detective story should have. One of the major controversies that surrounded The Da Vinci Code was its condemnation by the Catholic Church. You can understand this, due to the fact that The Da Vinci Code accused the Church of having covered up the truth about Christianity for its own purposes and having employed assassins to remove witnesses. The mystery was why The Da Vinci Code film (as opposed to book) accrued all this attention as opposed to any of the other numerous anti-Catholic films – see the likes of The Omen (1976), The Rosary Murders (1987), The Butcher Boy (1997), Stigmata (1999), or for that matter Hudson Hawk (1991), which has a surprisingly similar plot to Angels & Demons about people seeking secret treasures hidden in The Vatican archives. The answer probably has something to do with the size of the Da Vinci Code cult and popularity. Angels & Demons evokes far more in the way of Catholicism than The Da Vinci Code – where The Da Vinci Code kept the Church as a shadowy villain on the periphery; Angels & Demons sets the bulk of its plot inside The Vatican City, where Ron Howard and his production team have made painstaking effort to replicate various places in great detail after not too unexpectedly being denied permission to film there by The Church. Despite the controversy stirred up, you get the impression that Ron Howard and co are trying to soften their approach towards the Church. The film does have an interesting subtext of venturing into the debate between faith and science, contrasting Langdon’s academic rationalism on one side and the faith of the Church on the other. However, other than setting this up for the fulcrum of the denouement in regard to the killer’s motivation, this is not particularly explored – the film, for instance, makes no effort to ever get inside or give any argument as to why either side believes what they do. For a time, when the film starts talking about the antimatter explosion as the spark of God, one thinks that Angels & Demons might be jumping off into the places where John Carpenter’s conceptually wild Prince of Darkness (1987) existed. The explosion of the antimatter bomb is clearly evoked in terms of simple-minded religious awe – the bomb releases a display of pretty lights in the sky that look like a nebula; cue an awe-filled musical score trying to persuade us that this is a religiose moment. The conclusion this gives is the cautious middle road that Contact (1997) tried to offer in suggesting not that the argument between faith and science can be won but rather in saying that both are different sides of the same coin. I am prepared to go along with that up to a point but the film’s conclusion is surely an insulting one to any intelligent person – showing the masses being willed into a naive adoration of an heroic figure simply by a wondrous display of pretty lights. That the film never deigns to disavow the crowds of their awe and hero worship – indeed, seems to arrive at an ending that agrees to cover up the truth about what happened – as well as celebrates the proclamation of the new pope as a triumph and even ‘rewards’ Langdon with the gift of a rare document, we have a film that ironically ends up being a proponent of the very secretive and closeted hierarchical authority that The Da Vinci Code regarded as a fundamental betrayal of history. Ron Howard and Tom Hanks returned for a further Dan Brown adaptation with Inferno (2016). Ron Howard’s other genre films are:– the mermaid comedy Splash! (1984); Cocoon (1985) about a meeting between geriatrics and extra-terrestrials; the George Lucas sword-and-sorcery collaboration Willow (1988); Apollo 13 (1995) based on the true life 1970 space mission disaster; the Dr Seuss adaptation How the Grinch Stole Christmas (2000); the supernatural Western The Missing (2003); and Solo: A Star Wars Story (2018). Screenwriter Akiva Goldsman has also written the scripts for the Joel Schumacher Batman films Batman Forever (1995) and Batman & Robin (1997), the big-screen remake of tv’s Lost in Space (1998), the witchcraft comedy Practical Magic (1998), the Oscar-winning A Beautiful Mind (2001), I, Robot (2004), I Am Legend (2007), Insurgent (2015), The 5th Wave (2016), The Dark Tower (2017), Rings (2017) and Transformers: The Last Knight (2017). He made his directorial debut with the fantasy Winter’s Tale (2014), followed by the horror film Stephanie (2017). Goldsman has also produced Renny Harlin’s two genre outings the monster movie Deep Blue Sea (1999) and the serial killer thriller Mindhunters (2004), as well as the comic-book adaptation Constantine (2005), the superhero film Hancock (2008), the paranormal investigators tv series Fringe (2008-13), the supernatural Western comic-book adaptation Jonah Hex (2010), Paranormal Activity 2 (2010), Paranormal Activity 3 (2011), Paranormal Activity 4 (2012), the tv mini-series adaptation of Arthur C. Clarke’s Childhood’s End (2015), Guy Ritchie’s King Arthur: Legend of the Sword (2017) and the tv series’ Star Trek: Discovery (2017– ) and Titans (2018– ). David Koepp’s other genre films include the screenplays for the very weird Apartment Zero (1988), the psycho-thriller Bad Influence (1989), Robert Zemeckis’s immortality black comedy Death Becomes Her (1992), Jurassic Park (1993), the mystical superhero film The Shadow (1994), The Lost World: Jurassic Park (1997), Spider-Man (2002), War of the Worlds (2005), the children’s film Zathura: A Space Adventure (2005) and Indiana Jones and the Kingdom of the Crystal Skull (2008). As director. Koepp has also made the downfall of civilisation drama The Trigger Effect (1996), the medium film Stir of Echoes (1999), the Stephen King adaptation Secret Window (2004), Ghost Town (2008), Premium Rush (2012) and Mortdecai (2015).